I hope you all have a restful & happy Thanksgiving! Take time with your families and bask in the beauty of all your blessings this year. Enjoy the long weekend! Basket Raffle: Thanks for ALL your help with our raffle. We sold close to 10,000 tickets and raised $10,000! Many students were able to earn the cost of their ENTIRE trip! Don’t forget the first deposit for the trip was due last week if you’re going. It is $350 per person. The next payment will be due in January. Math: Last week we worked with geoboards & centimeter dot paper to look at fractions. It’s a new way for all of us so bear with us as we learn! We’ll be doing more fraction work this week. Reading: I did send home a reading log this week just like normal. This log is due on Mon, Nov. 30th. There are 4 blocks to be completed any time between tonight and next Sunday night. Science: Last week we started designing our own ecosystem by starting with producers. We’re moving on to consumers this week! Supplies: We are running low on paper in our classroom! If you could donate some, we’d appreciate it. Thanks! P.S. We’re working on the daily homework posts! Sorry!! 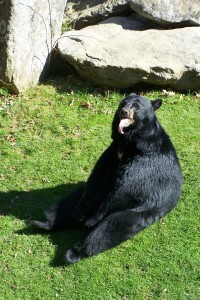 Our bear friend from Grandfather Mountain. Read 30 minutes, Reading Log–Reading Log is due tomorrow! 4 blocks should be filled in. Write spelling words in ABC order. Study words test is tomorrow! Bring a Hershey Bar for math lesson tomorrow! Baby Pictures are due ASAP! Sell those Raffle Tickets! ALL tickets are due MONDAY, Nov. 16th!! This week we’re out school on Wednesday for Veteran’s Day! Thursday and Friday are regular days! All raffle tickets are due next Monday the 16th. First deposits for our DC trip are due next Friday the 20th. Book orders are due by this Thursday. We will have a spelling test this Friday.